Meanwhile Tropical Cyclone Tatiana was named by the Australian Bureau of Meteorology on February 11th at 7pm, since then TC Tatiana has been moving south-southeast and was reclassifed as Tropical Low at 7am this morning (Sunday 14th February). 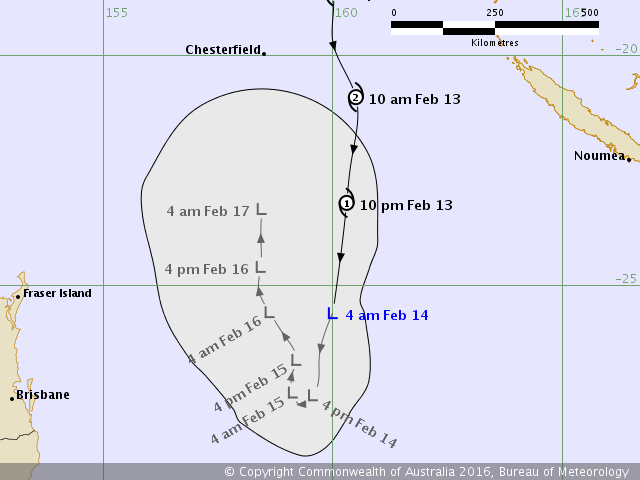 Historical track of TC Tatiana and TC Winston to 7am Sunday February 14th 2016. Image via NOAA Earth System Research Laboratory. TC Winston was located southeast of New Caledonia (about 800 km southeast of Noumea or about 850 km south-southwest of Nadi) at 7am today (Sunday 14th February). The central pressure of the cyclone was estimated to be 950 hPa, making it a Category 4 cyclone, and it was moving to the south-southeast at about 22 km/h. Winds close to the centre of the cyclone were estimated to be around 170 km/h, and forecast to decrease to 160 km/h by 1pm today. Tropical Low Tatiana was located over the southern Coral Sea, about 730 km east-northeast of Brisbane at 7am today. The central pressure of Tatiana was estimated to be 994 hPa, and it was moving south at 28 km/h. Winds close to the centre of the cyclone were estimated to be around 55 km/h. 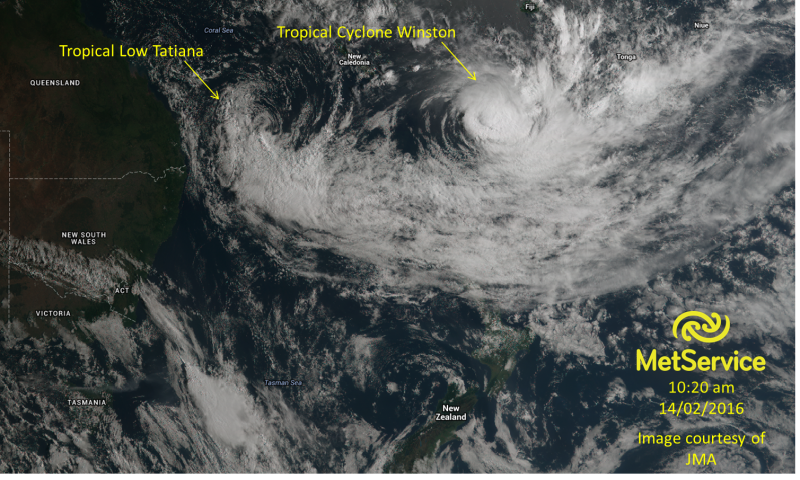 True colour satellite image showing the location of TC Tatiana and TC Winston at 10.20am Sunday 14th February. Over the next 24 hours TC Winston is expected to weaken slightly and turn northeast, away from New Zealand. 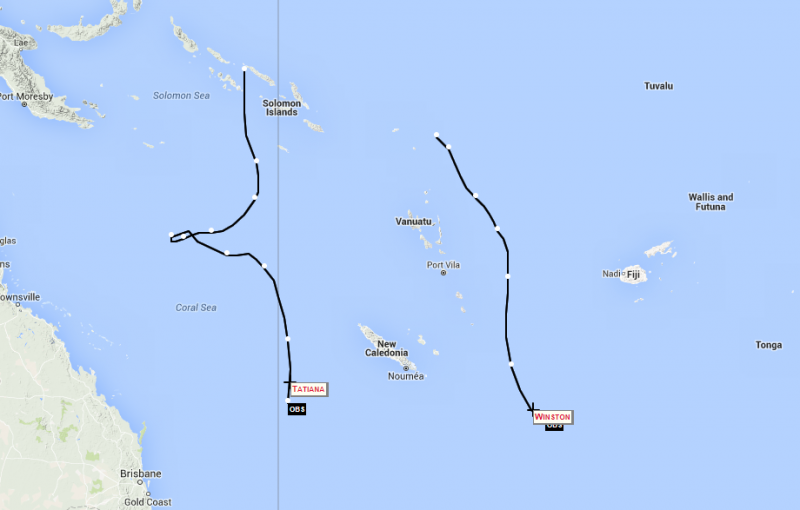 Winston may then move towards southern Fiji, as shown in RSMC Nadi’s forecast track below. 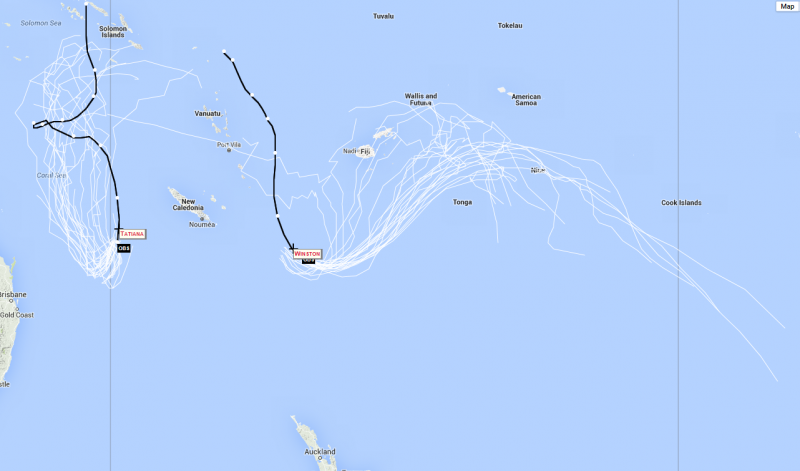 Forecast track of TC Winston produced by RSMC Nadi in Fiji. Tropical Low Tatiana is expected to remain below TC strength and continue to move south over the Coral Sea before turning north overnight. Forecast track of TC Tatiana produced by Bureau of Meteorology. The graphic below shows a range of possible future tracks for both tropical cyclones based on data supplied by the UK Met Office. A majority of these have TC Winston turning northeast, and Tropical Low Tatiana is expected to continue south before turning north. Range of possible future tracks for both tropical cyclones based on UKMO data. Image from NOAA Earth System Research Laboratory. There are currently no direct impacts expected for New Zealand as a majority of the models keep both cyclones well to the north of us. Indirect impacts could be an increase in swell for northern areas and easterly winds, neither of which are expected to be severe at this stage and MetService have no warnings associated with cyclones in place for New Zealand at present. MetService meteorologists are monitoring both of these tropical cyclones closely and provide tropical updates daily via the Tropical Cyclone Activity page on metservice.com where you can also see hourly satellite imagery. We’ll post further updates on TC Winston and TC Tatiana in the coming days, and as always, you can keep up to date with the latest forecasts and warnings at metservice.com.